Based in Piccadilly, this store is one of the most famous department stores in London. Every product is wrapped to perfection and the store always has elaborate and head turning displays. Fortnum & Mason has hundreds of shops within the establishment from perfumes to homeware; you will be spoilt for choice. The store is famous for being home to the royal family’s favourite food hall which exhibits an impressive layout of biscuits, cakes, fruit baskets and more. Fortnum & Mason also sell high quality hampers that include wines, cheese, chutneys, beers, biscuits, chocolate, toys and much more. Fortnum & Mason is the perfect place to pick up a gift and even if you don’t fancy shopping it is a beautiful building to look around. This is the 300th retail outlet built by Apple so naturally they wanted to make it a special one. With oak tables and a stunning glass staircase this is Apple’s largest store in the world. The shop is three storeys tall and located in a former nightclub and restaurant. Apple tends to use up a lot of space in their shops and that is the first thing you will notice as you walk into the shop. The shop is split into different rooms with the main room being an open atrium which looks beautifully historic. iMacs, Macbooks, iPods and iPhones are all in the separate rooms and if you purchase an Apple product you get taken to the ‘Start Up Room’ where Apple staff will talk you through setting up your new product (free of charge). There is also a Community Room in which advanced workshops take place and it also features a Genius Bar where experts help with any questions you may have about your Apple product. The Regent Street branch brings in 60 million pounds a year and people expect that the Covent Garden branch will be the highest earning Apple store in England in the future. Harrods is the most famous department store in Britain, and potentially even the world, which means it offers a great day out. Similar to Fortnum & Mason, the store sells clothes, shoes, beauty, food, drinks, gifts and home wares. With high end brands such as Dolce & Gabbana, Roberto Cavalli and Armani you will need to have a lot of spare money to spend there. The department store is huge and covers a large part of Knightsbridge and boasts hundreds of shops in just one building. At Christmas the front of the store is covered head to toe with lights and decorations and some of the most elaborate window displays ever seen. Harrods also opens up a Santa’s Grotto which is plastered in extravagant festive decorations. 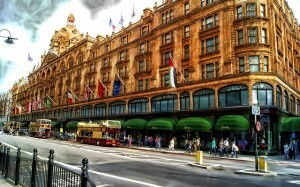 Harrods sells an extraordinary variety of products from food and wine to children’s toys and designer handbags. Heal’s was established in the 1800’s and sells high end, high quality furniture. Even though the company has been open a while it has managed to keep up with the trends of modern furniture. Heal’s is well-known for its well-crafted products but this is of course reflected in the prices. The furniture is well worth paying for because of the great quality of them, and while you are there you can also take part in food tasting, demonstrations and huge events which are all held on a regular basis. In total, the shop is 42, 000 square foot and the furniture is spread over three floors with modern designs everywhere you look. The store also has a gourmet kitchen department with a luxury spa, lighting showroom, a café and even a sleep studio! All of these department stores are a fantastic way to spend a day out but make sure you are willing to splash the cash!